Since the AccuWeather Forums termination date has been placed at "end of 2018", I'm trying to port the comments from the winter thread there over here, just for continuity, if "Forum Ragnarok" occurs. Apologies in advance for the format, I'll work on cleaning it up later. Figured I'd kick start this again since met winter 2017-2018 closes out end of day tomorrow. As with previous years, I always find it nice to send off the past winter with the opening of a new thread for the next one. We can use this thread to discuss our thoughts, the trends and any outlooks/forecasts... both professional and amateur. I am a longtime lurker and seldom poster. Let this post serve as a huge thank you to all who contribute to this thread every year in such a meaningful way. Truly a pleasure to continue to learn from this community. Here's to hopefully a great 2018-2019 winter season in your backyard! Cheers! I'd like to have a second consecutive Christmas with seasonable temperatures. That'd be nice. My official spring 2018 forecast for the 18-19 winter based on weak Nina or neutral conditions. February was SER on steroids with west coast troughing (Marchuary will not repeat next spring). 2002 - We had a run in mid May with near freezing lows and much of April was below normal save one week of a heat wave that erased it. It turned colder than normal in October and first snow (Baltimore) was relatively early on Dec. 6. We know how that winter turned out. 1995 - After a very mild winter, much of April was chilly. Winter hit Nov. 11 and stuck around until the following April. 1987 - My favorite example. 2nd half of March and much of April was chilly (I went to Baltimore's Opening Day - it snowed that morning). The following October was cold and the Veteran's Day storm was followed by a cold outbreak with some record lows. I generally agree in that I think there is more cool season to cool season continuity than most believe. IMHO the warm season fits into the category of noise rather than signal regarding true anomalies to the true global circulation pattern. Again, IMHO the most substantial changes to the global circulation occur around January coincident with peak forcing associated with ENSO. "One thing to note is, the QBO finally came in negative for the 1st month down to 50mb. Once QBO is negative it takes a while, it stays in that phase for a long time. Support of that is low solar activity. We can see some blocking trying to return again next winter. Question mark, is it early, or is it late? What I'm seeing on the modeling is a positive NAO, stronger Arctic High aloft which means theres too much westerlies coming across Canada that's not a cold, we known history last few yrs that if its westerly its gonna be hot, its gonna be warmer warmer than normal and exceed pretty high so we'll have to keep those departures up in these areas which we have for November & December right now. But January still iffy, but we do feel that with Negative QBO, Low Solar, and El Nino with the strong southern track features that maybe by mid-late winter we got some big systems to watch out for, big blocking events, could be some big coastals.. That's something way off but I just wanted kinda throw that out to you today"
Analog ingredients to keep in mind: more than likely weak to moderate El Nino & low solar. Of course we'll wait on location of Nino. I have not research any analogs & doubtful I will for a while. 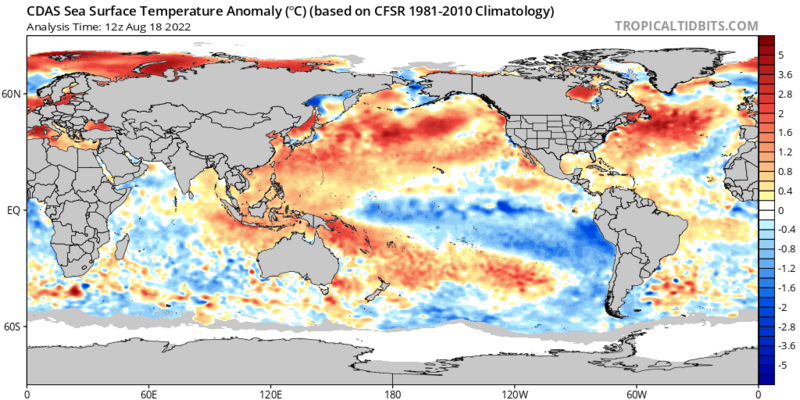 Looking like neutral to weak nino conditions maybe modoki look as the eastern PAC has been relatively cool even with the large warm pool underneath the other regions. Thinking we have an early chance at SSW potential this year with the remnants of the -QBO around low solar tends to have more impact on blocking situations and i mean the way we have been seeing it over the past couple months its not too improbable to see it continue. We will speed things up as usual in september/october time frame so it will be interesting to see the transition occur. Also another note is as usual watch how we decline in ice this year. If we see a large reduction in the next month or two we could throw a wrench in some ideas, but overall there has not been too much reduction since april/may area where it was roasting up there (relatively speaking). It is almost like there has been a little bit of a brick wall setting up that has kept the arctic protected from large moisture content going up and causing some crazy melts. Been awhile since I have really monitored anything from the Arctic anybody know of sites to find comparitive data for month to month or day to day of the sea ice in both the Arctic and Antarctic? Anyone with more knowledge than me? Because to me it's not looking too good right now. Cooling off of Alaska and warming up in the eastern enso region. It's way too early to look at SST's & draw implications for winter at all. SST's can change a lot in a relatively short period of time. ENSO still uncertain at this time. Arctic holding on nicely as it did in 2009 and 2013, lets make it clear it is not recovering just holding its own for now. It will be interesting to see how things shape up. I see many outlets are going with a Modki El Nino for the winter. Too early to say right now but that would be great for the mid atlantic. I would like to see how the developing EKW takes hold and what it does to the temps before I start thinking down that path. Weak nino seems still possible but warm neutral seems to be the thing that sticks out. If we start to see a large reversal in things over the next month or two then we can fully say yes to weak nino status. The atmosphere is trying to bring it to a nino state gotta wait and see if it can manage to do so. It does have a decent track record though, especially in respect to other climate models, so maybe it's just been struggling post-Super El Nino? Who knows, maybe this year will be the year that it gets back on track! Looks like our +PDO is slowly coming on. Look at the cold water NW of Hawaii and the warming of waters off the NW Canadian coast and off the coast of southern Alaska. Does anyone know what a +PDO and a central based Modoki El Nino means for New England? I didn't post because I thought it had it nailed. So in my town in CT, we are seeing A LOT of acorns falling already. Isn't a lot of acorns a sign of a bad winter coming? Haha. what?? :blink: Oak leaves just got full few weeks ago. Acorns take 4+ months to mature and a month to drop...No way at all acorns have grown and or fell yet. I suspect the tree is sick or maybe its another type of nut? Can you post some pictures? Not that I don't believe you, just want to check how large the acorns are. I posted more so out of amusement & love...lol. What's interesting is that CanSips, NNME, CFS, JAMSTEC seem to all agree on a lot of Alaska & west coast blocking & troughiness east. They disagree on exact anomalies. I pretty much ignore anomalies. I also would not make too big of a deal on the blocking agreement idea at this point....but certainly have noted. Euro showing a super hot December in the east, just saying. So are some others...then nearly universal wintry east look for JAN/FEB. Heck...CanSips has below normal anomalies for U.S. which I was beginning to wonder if CanSips ever would again. CANSIPs is a joke for seasonal forecasting. Yeah, JAMSTEC is about as good as it gets for winter lovers. The down side of that is just that; it can't get any better... which isn't something you would want this far out. Exactly!! With ENSO evolution still unknown anything being modeled this far out doesn't mean much at all. Any of the cold models are based on the assumption of a modoki/hybrid El Nino. But even a modoki/hybrid El Nino is no guarantee for cold in the east. Things can go wrong for sure. CPC released yesterday. Winter 2018-2019 for USA...I'll post maps so we can have a good laugh as they update monthly. 70% chance of weak El Nino which doesn't mean much for my area. One of the strongest ever 2015-16 we had a normal winter and above normal snowfall while areas like Aberdeen SD had just the opposite and not that far away. I'll include November since its not part of winter outlook the El Nino isn't even developed yet but they slapped on the usual above normal temperature forecast. October was above normal too and we've been down to 12°F and had 9 freezes in first 19 days and running -8° on month.